This unisex Next Level Baseball tee gives the perfect blend of three fabrics--50% poly 25% ringspun combed cotton and 25% rayon. With 4.3oz and 32 singles, this is the perfect soft tee for looking stylish while lounging, working out or whatever the day has in store for you! **White bodies are heathered--NOT solid white**. Each tee is pre-laundered for reduced shrinkage. The 1x1 baby rib collar and satin sewn-in label add nice finishing touches. Please note: first color is SLEEVE color, second is body color. For example, Heather Black/Vinatge White would be a white body with black sleeves. Unisex sizing generally runs a little slimmer in the body than standard men's sizing. 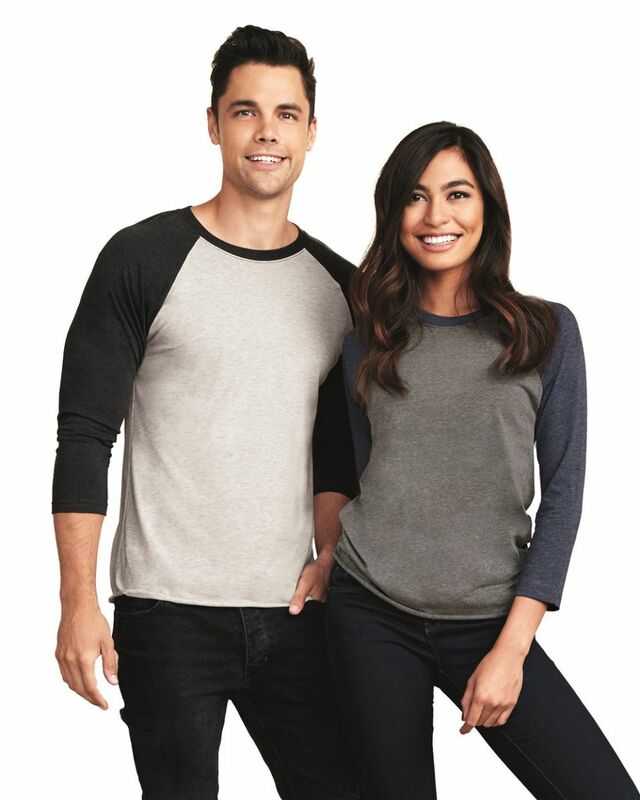 The Next Level 6051 is a unisex 3/4 sleeved raglan tee offered in heathered colors to provide a vintage look. BlankStyle was the only company with adequate stock. Great service and confirmed what was in inventory immediately on the phone. Excellent shirt for vinyl and embroidery. Very little, if any, shrinkage when laundered. Very soft. Color remains after several washings. Great item & customer service! The order came in quickly. One of the shirts didn't come in so I contacted them & they sent a replacement quickly. The shirts are soft & comfortable & fit well. I will definitely order more in the future. Loved them! Very pleased will order again! Q: I have one of these at home and LOVEEEE it! I want to order more but want to be sure it's the correct style/fabric. The RN# on the tag is RN111449. Is this the correlating shirt? Q: How long does shipping take for these shirts if they are in stock? A: Expect 3-5 business days for deliveries within the continental US, however ship time varies depending on what you're ordering and where you're located. Q: Are the next level adult raglans no longer being offered?